Do I need an “A” in Organic Chemistry to get into Medical School? This is a common question from undergraduates seeking to satisfy requirements of medical school applications. First, let’s start with some stats on getting into medical school. The American Association of Medical Colleges reported that total students enrolled in medical school (over 4 classes of students) has risen from 77,353 in 2009 to 83,472 in 2013. That’s good news, as this indicates that enrollment has risen by more than 7000 students, or roughly 1700 more slots for incoming classes. This means that the chance of entering medical school is higher than it has ever been! However in 2013, of the 20,055 students who matriculated into a medical school, 48,014 applicants applied with an average of 14 applications per applicant, for a grand total of 690,281 applications submitted and reviewed. That translates to roughly a 40% acceptance rate. This concludes getting into medical school is fiercely competitive which is why many student obsess about getting the best grade possible. In an article from U.S. World News, Johns Hopkins premed advising office suggests that an applicant with a GPA of 3.5 and a MCAT of 30-31 stands a “good chance” of getting accepted, but factors such as personal statements, experience, community service, spoken languages and applicant interview also majorly impact your chances. No doubt you must demonstrate a mastery of all of the subjects required for medical school applications, including organic chemistry, but clearly grades are not the only metric of acceptance. Here are a couple of suggestions for maximizing your organic chemistry studying to get the edge on the competition. Students often spend considerable time and energy complaining to teachers and graders over 1 or 2 points here and there. This is penny-wise and dollar-foolish. A few points will have little to no impact on your grade. The most important use of your time studying are the big pictures. Understand where minor points were taken off and make efforts to avoid these simple mistakes in the future. Keep calm and move on! Professors have only an hour or two at most to examine your knowledge of weeks of material. That means they have to ask you the major concepts in order to satisfy the curriculum and there are only so many types of questions they can ask. Seeing as many practice problems as possible will give you a very good understanding of the big picture and ensure success on most of the test. Sometimes, professors will throw in a “really hard” example. These questions are meant to discriminate between the “A’s” and the “B’s.” But, if you have practiced many problems, your chances for having seen these questions raise dramatically. It’s a win-win to practice everything problem you can find! Even the best organic chemistry student will struggle with a concept here and there. Regardless of your past success in the course, outside tutoring will always help. 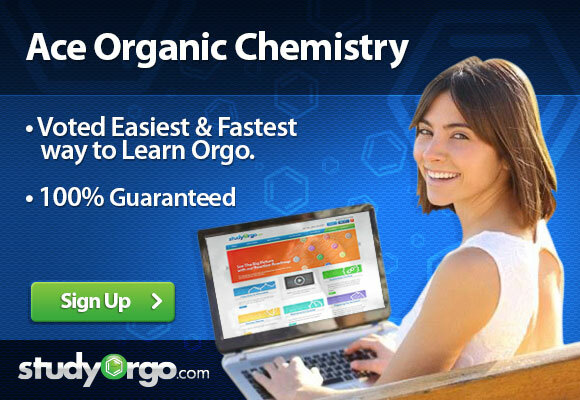 At StudyOrgo, we have developed intuitive and in-depth descriptions of most reactions in organic chemistry. We take each mechanism step-by-step with many examples to show you how reactions proceed and point out how they can vary. With hard work and assistance from StudyOrgo, you are sure to get the A you deserve and give you the extra edge when preparing for medical school!